Here's all the information you need to learn how to taste absinthe, and to submit a review. These criteria are based solidly on the known characteristics of properly made absinthe in the mid to late 19th century. These characteristics have been documented through modern scientific and organoleptic analysis, i.e. gas chromatograph/mass spectrometry and the tasting of many surviving examples. Our reasoning is that when someone approaches absinthe, they are usually expecting the genuine and complete item of the Belle Époque, that imbibed by Van Gogh, Baudelaire, Rimbaud, Verlaine, Satie and Toulouse-Lautrec, with the full flavors and characteristics of the most mysterious drink in history. What did the patrons of the Moulin Rouge and the Cabaret du Chat Noir smell, taste, and see when they drank absinthe? This is the standard against which we judge modern absinthes. The structure of the system was based initially on the University of California at Davis 20-Point Scale System Organoleptic Evaluation Scoring Guide for Wine, and adapted for use with absinthe. This guide is designed so that even someone who is relatively new to absinthe can create a useful rating and record. If you study the criteria and standards in this guide and use them in your review and scoring, you will soon be able to compile a useful historic record of your experiences. This system was designed for use with the form above and has been adapted for online use so that a cumulative average of scores submitted from many consumers can help advise others as to the most popular and well-made absinthes. The system is divided into two parts: the Score and the Comments. The numeric Score will determine how well an absinthe measures up to expected quality and characteristics; the Comments will serve as a record of your impressions and how well you enjoyed the absinthe. The ratings are weighted so that more important criteria, such as taste, have a stronger impact on the final score than less important ones, such as appearance. A five-point rating on flavor is heavier than a five-point rating on louche. Decimals may be used in increments of 0.5. In this way the general taste and flavor of the absinthe, clearly the most important criteria, are broken into Flavor/Mouthfeel and Finish, sharing 30% of the total score. These along with Overall Impression account for 50% of the score, leaving the remaining three criteria to share the other 50%, with aroma being the most important of the three. The Appearance is composed of the hue, depth-of-color, and clarity, before water is added. The famous green hue of absinthe is actually an incidental effect of the secondary infusion of finishing herbs. The real intent of this infusion isn’t specifically to color the absinthe, but to provide additional flavors and aromas. The green color is an attractive bonus resulting from the chlorophyll extracted during the infusion. Since chlorophyll degrades rapidly in light, particularly sunlight, absinthe should be bottled in dark glass and kept away from direct light. Older absinthes may turn yellow, amber, or even brownish with time and may still retain excellent quality. However if this degradation is allowed to happen rapidly it’s nearly always accompanied by a loss in quality and the introduction of off-flavors and smells. Although there is historical precedent for artificially colored absinthes, they have always been considered of lesser quality. However, for review purposes here, any artificially colored absinthe is to be evaluated based on the same criteria as a naturally colored one. Most artificially colored absinthes will lack the flavor and aroma qualities accompanying natural coloration, and will be more monochromatic than nuanced, thus limiting their scoring potential within the system. Fortunately, according to US law, all artificial coloring must be disclosed on distilled spirits labels. The hue should be natural and organic-looking and should be pleasing and have nuance. Verte (green) and blanche (clear white, colorless) are the traditional colors. Deep yellow and golden-brown amber hues known as “feuille mort” (“dead leaf”) are acceptable, even desirable, in vintage absinthes. Rouges (reds), while very rare, weren’t unknown but there is no consensus on evaluation. The ideal hue of a verte absinthe has almost universally been described as “peridot” or "emerald" after the stones of those names. Peridot is a lighter, slightly yellowish shade of green, as distinct from the slightly bluish emerald hue. Ideally, an absinthe will have a rich, vibrant hue; not so pale as to appear watery, and not at all dark. A deep, heavy green indicates over-finishing, whether from too much herbal matter in the finish, or too spending too long in infusion. Over-finished absinthe will often have an unappealing, muddy, “pea soup algae” appearance after adding water. If not properly stored, these absinthes will also quickly develop a greater abundance of chlorophyll degradation compounds, affecting their flavor and aroma. Clarity or brilliance indicates that the absinthe is free of haze or suspended herbal particulate and starches which can result from improper finishing. These can appear as haze, cloudiness or as small clumps of cloud-like flocculate floating suspended in clearer liquid. While a very light sediment can be acceptable in a naturally finished absinthe, when decanted into a glass the absinthe should be perfectly clear and gemstone brilliant, with flashing reflections and no haze. In a blanche, or white absinthe, the appearance should be crystal clear, diamond brilliant, and free of any tint or hue (absolutely colorless). 1 = Totally inappropriate or uncharacteristic. 2 = Artificial looking, substandard or deficient. 3 = Acceptable, but hazy/contaminated, too light or dark. 4 = Correct, clear, bright, natural, attractive. 5 = Topnotch, vibrant, jewel-like, nuanced. 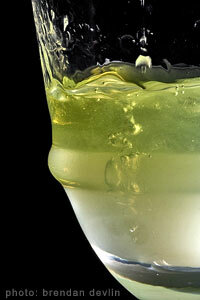 The "Louche" is the final clouded effect and condition of absinthe after cold water is added. Sometimes referred to as the “ouzo effect”, its characteristics are indicators of the quantity and quality of botanical oils in the absinthe. The majority of oil present will be anethole from the aniseed and fennel but other botanicals, particularly seeds and spices, also contribute. Leafy matter such as the wormwoods, melissa and hyssop make no significant contribution to the louche. The louche should be rich, but translucent, so that light and reflections pass though the bottom, more narrow part of the liquid, giving warm amber highlights with shots of blue and green. This is the origin of the legendary “opalescence” of absinthe and indicates a healthy but restrained quantity of anise and other oil-rich botanicals in the recipe. It shouldn’t be chalky or flat, not too thick or milky, but contain interesting refractory effects. Nor should it be so thin as to be nearly transparent. An overly thick louche often portends a taste which is too heavy with anise—possibly from injudicious use of star anise—and will usually be overly tongue-numbing; while a too-thin louche may lack fullness and flavor. Too much star anise can also be responsible for an opaque, flat and chalky-looking louche. Some makers of faux absinthe aim to appeal to consumers who lack an appreciation for aniseed and fennel. Knowing that a good louche is an expected characteristic of absinthe, they have actually used other botanical matter, such as gums or resins, to achieve a louche effect in the absence of anethole. These often leave a sticky, non-water-soluble residue on the inside of the glass and on the drinker’s lips. Ironically this is a case of history repeating itself, as this tactic is identical with that used by inferior and faux brands of a century ago. During the addition of water to absinthe, a variety of swirling, rolling, clouding effects, accompanied by trails following the path of the water into the absinthe, may be seen. While this is one of the attractive characteristics associated with the preparation and consumption of absinthe, the variables involved, including water temperature, method and speed of pour, the amount of turbulence caused by the pour, ABV, amount of anethole and its source (star anise, green anise, or anise oil), all combine in so many ways that louche action is no indicator of an absinthe's quality. As such, "louche action" is not to be considered in the Louche Rating. Comments may include these observations, however. Be sure not to over-water or under-water your drink. In general, ratios of three to five parts water to one part absinthe will work for evaluation purposes. Indeed, these are the ratios at which absinthe was drunk in the pre-ban era and which most quality brands are formulated for. For more detailed information concerning dilution, see the “How To Taste” section, “The Dilution”. 2 = Very slight, almost none. 3 = Acceptable, but too translucent or opaque, one-dimensional. 4 = Correct, attractive, opalescent. 5 = Defined, highly opalescent, three-dimensional. The aroma of absinthe comprises the smells of the fundamental components, such as those of the “trinity” (wormwood, anise, and fennel), and the more subtle and complex impressions resulting from the combinations of the fundamentals and influences of the absinthe making processes, and aging if applicable, after water has been added. The principle botanicals in absinthe are anise and wormwood, but other botanicals should be evident in the aroma besides these. The fragrance of good absinthe has been compared with the smell of an alpine meadow on a mild spring day. The best absinthes have been described as a soft, spicy and complex floral perfume. Wormwood is an unfamiliar fragrance these days, so it’s difficult to describe in print, but it has a clean, fresh, floral, slightly minty, camphorous quality. It’s fairly unusual on its own and not particularly enticing, but when blended with anise and fennel, it becomes immediately apparent why this drink was so popular. Ideally, the aroma dramatically increases and expands or blooms when the water is added, as the plant oils come out of solution with the alcohol. A pleasant fragrance should fill the air in the surrounding area. There should be a good balance of the components, and while slight imbalances are what create the individual character of each absinthe, gross imbalances are not desirable and are always considered a fault. Comments may include observations of the aroma neat, but they are not to be considered in the “Aroma” rating. Absinthe shouldn’t smell grassy, vegetal, sea-weedy, vinegary or strongly of “black jelly beans.” The latter is almost always a sign of over-use of star anise. It also should not smell excessively of alcohol, neat or louched, but rather have a good balance of the alcohol and other components. The smell of over-cooked artichokes or cabbage is indicative of poor distilling technique. This is the smell of the end fraction of a distilling run, the “tails,” which should be discarded or—when using the traditional Absinthe Suisse process—added to subsequent batches. Since the tails can contain a fair amount of expensive alcohol, some distillers choose economy over quality. Any of these should be considered serious flaws. 1 = Inappropriate, unpleasant, or predominately alcohol. 2 = Too weak/strong, peculiar, or very unbalanced. 3 = Acceptable, but idiosyncratic or undistinguished. 4 = Correct, alluring, intriguing, very pleasant, clean. 5 = Distinctive, complex, balanced, expansive. The flavor of absinthe comprises the tastes of the fundamental components, such as those of the “trinity” (wormwood, anise, and fennel), and the more subtle, complex, and compounded taste sensations resulting from the combinations of the fundamentals and influences of the absinthe making processes, and aging if applicable, after water has been added. Mouthfeel is the combination impression comprising sense of weight, or body, and the tactile perceptions, or texture. As with the aroma, the best absinthes are complex and interesting, with subtle, enigmatic, and mysterious flavors, the sum of which are very refreshing. Anise and fennel should definitely be in the forefront—absinthe is an anise drink—but they must be balanced with that of the wormwood and other herbs and not remind one of licorice candy. Star anise is the main culprit of this flaw. Star anise is an inexpensive alternative to the better quality aniseed and fennel seed. Star anise oil is used as a flavoring in licorice confections and liqueurs such as sambuca and economy brands of ouzo and raki. Hence, it’s a very familiar—and very strong—flavor. Nearly all economy or mass-produced absinthes use star anise oil as a flavoring additive rather than being distilled from genuine aniseed and fennel seed. Absinthe should taste mildly bitter and slightly dry and astringent, but not overpoweringly so; no more so than tea or coffee. It shouldn’t taste grassy or spinachy. While mint is among the traditional herbs sometimes used, it should appear to be in balance, and not overpower the more subtle herbs. Nothing is as inauthentic as an absinthe that tastes more like mint schnapps. Absinthe is intended to be a mild aperitif, and the mouthfeel should support this. There should be some sense of weight, but it should not be overbearing on the palate, certainly not to the extreme of seeming heavy and chewy. Its texture should be smooth, silky, clean, and dryish, never grainy, oily, sticky, or slippery. While some light tingliness or slight numbing of the palate can occur, an aggressive “pointed” prickliness, usually caused by overuse or exclusive use of star anise, is not desirable and should be considered a flaw. Just as with coffee or tea, whether or not to sugar absinthe is entirely a personal preference and is genetically influenced. Those who perceive absinthe as bitter or astringent enough to always require sugar, as opposed to those who perceive anise as a form of sweetness on its own, don’t simply have differing opinions about an identical experience, they literally experience the taste differently. They are having two different experiences. You may hear someone say that a particular absinthe “doesn’t need sugar” but this is an uninformed opinion. The sugar is for the drinker, not the absinthe! Key Qualities: balanced, interesting, refreshing. 1 = Unpleasant or inappropriate. 2 = Highly flawed, very unbalanced, or peculiar. 3 = Appropriate, but idiosyncratic or undistinguished. 4 = Correct, interesting, pleasant, enjoyable. 5 = Rich, complex, well balanced, delicious. The finish of absinthe comprises the lingering flavor impressions and tactile palate sensations after the louched drink has been swallowed, or expectorated (spit out). The finish should be smooth, dryish, slightly bitter, fresh and crisp, and have good length (duration). It shouldn’t be excessively tongue-numbing, although some numbing from the anethole is to be expected if several glasses are drunk. Unpleasant bitterness should be penalized heavily. Finishes can range in style from a very “straight line” fade of all of the palate impressions, to much more complex, with changing of the emphasis of various flavor and tactile elements as it lingers. Since both can be satisfying, it is the quality and length of the finish, not the style, that should be considered in evaluation. The finish should never be harshly drying or prickly. This is usually caused by an excessive or exclusive use of star anise in the formulation. A lingering mouth-coating, bitter, metallic-yet-buttery sensation, especially when accompanied by the above mentioned artichoke flavor/smell, is undoubtedly tails and is a mark of poor craftsmanship. These both should be considered serious flaws. Key Qualities: crisp, clean, pleasant. 1 = Uncharacteristic, off-putting, or offensive. 2 = Recedes quickly, or lingers unpleasantly. 3 = Lingers pleasantly, no outstanding characteristics. 4 = Interesting, intriguing, complex, long. 5 = Exceptional, detailed, balanced, very long. The overall impression is the reviewer's best estimate of where the absinthe they are reviewing falls into a range of quality for the entire category. While it would be unusual for a particular absinthe to score as widely as both a “1” and a “5” in separate criteria, it is not unusual for absinthes of various quality levels to score over a range in the individual criteria. This category serves to equalize and ground, to some degree, the scorings in the other categories. The reviewer's conclusion of overall impression should be almost unconsidered of the scores in the other criteria, and should be more a question of: As a whole, into which level do I think this absinthe most appropriately fits? 2 = Barely acceptable, needs major improvement. 3 = Acceptable, idiosyncratic or proper mid-market standard. 4 = Above average, enticing, interesting, artisanal. 5 = Uncommonly exceptional, distinctive, world-class, elite. Next: How to Taste Absinthe. In spite of all the fuss made about the “absinthe ritual”, it’s really not much more complicated than fixing a cup of tea. However a bit of extra attention should be paid to the process when preparing absinthe for evaluation purposes. Most important is the need for consistency: every absinthe should be prepared the same way, every time. Once you develop your own style and rhythm you’ll likely find that you always pour that way. The best glass for this purpose will be clear (no color), fairly heavy (to retain cold), have a wide mouth (to facilitate nosing), and have a 7 oz. or more capacity. It’s helpful if the glass has features such as lines, flutes, facets or decorative markings which make it easy to pour a consistent portion each time. Failing this, use a permanent marker and a 1 oz. measure to make marks at the absinthe dose level and at the full, water-and-absinthe level. One normal absinthe drink is usually 1 U.S. fluid ounce of absinthe, or about 30 ml. Use clear, pure spring-water or purified tap-water if available. Distilled or reverse osmosis purified water lacks minerals and can lend an increased dry astringency to the absinthe. Use water that’s absolutely as cold as you can possibly make it. One way to do this is to fill your fountain, carafe or pitcher completely with ice. Then slowly add water while stirring vigorously. Always give the water a good stir right before pouring or dripping. Pre-ban style absinthe was made with the intention of being tempered with water. How much water? Well... that's where it gets tricky and is subject to personal taste and opinion. A very common recommendation is 3 to 5 parts water to 1 part absinthe. Several producers of absinthe in the pre-ban era recommended a specific ratio of 5 parts water to 1 part absinthe. Other well-informed drinkers simply pick a ratio such as 3 parts water to 1 part absinthe and run with that. And there are others. So what is correct? The simple answer is: whatever is satisfying to the particular drinker is correct, especially in the context of casual consumption. Let's face it. It's your absinthe. You may drink it any way you like. So let's take a look at some of these methods. This is probably the most common recommendation both by producers and informative sources, and it can be interpreted a couple of ways. First, because specific products carry this recommendation, implied is a wide range of acceptability of final dilution. If we accept that the most common bottled abv (alcohol by volume) of absinthes is from 56% to 72%, the final alcohol of the drink would range from 14% to 18% at the high end (the 3:1 ratio) to 9.33% to 12% at the low end (the 5:1 ratio). Second, as a recommendation not specific to any particular absinthe, it could also be interpreted that one should temper their absinthe with a little less water if the bottled abv is lower, and somewhat more water if the bottled abv is higher, thus implying that the recommendation for final alcohol is more consistent (and a narrower range) than the first model. Recommended by one of the finest products of the Belle Epoque, bottled at a very common and classic 68% abv, this (a 5:1 ratio) results in a final drink with 11.33% alcohol. Now it is doubtful they thought the consumers measurements would be so exact that every glass drunk would be 11.33%, so some take this to imply an ideal range of around 11% to 12%. Of course, because all absinthes are not bottled at the same abv, different ratios would be necessary to achieve this final alcohol percentage with absinthes bottled at other than 68%. One member here at the Wormwood Society has actually constructed a chart to guide those driven more to this approach. And a very useful feature is that the chart is wide enough to show final alcohol percentages both stronger and weaker than the proposed ideal range, if that is your personal preference. This approach presumes that the intent is for absinthes of higher bottled abv to be consumed at a higher final alcohol percentage, and those that are bottled at lower abv to be consumed at a lower final alcohol percentage. To return to the first example of a 3:1 ratio, and assuming bottled abvs of between 56% and 72%, this would again result in final alcohol percentages of 14% to 18%. Forget The Ratios, I Just Want To Drink My Absinthe! Try slowly adding water while watching the ‘hydrophobic’ layer of undiluted absinthe rise to the top of the clouding absinthe and water mixture below it. When the mixture is completely cloudy (the point where the undiluted line disappears), stir, smell, and taste the drink and then stop or slowly add more water to your preference. Another very interesting and informative practice for anyone new to absinthe, or for that matter when a particular absinthe is new to an experienced drinker, is to start the dilution at a ratio resulting in a stronger final abv (such as around 18% to 20%), and during tasting add a little more water maybe every couple of sips to see how the profile changes. In general, as dilution increases from this level, the impression of heat from alcohol, and numbing, primarily from anise, and a sense of “spiciness”, will gradually subside, just as the more delicate herbs and flowers will gradually come forward. The quest of most absinthe drinkers is to find the “just right” point of balance on that continuum, for them. Remember, you can't really ruin the glass as long as you have more absinthe to add back in, if you feel you have over-diluted the drink. You will want to be careful, however, with this practice when preparing anything irreplaceable, rare and expensive. All this said, the preparation of absinthe for evaluation purposes requires consistency. No matter what your personal preferences as to method, applying the same methodology, in approach to each absinthe one evaluates, is most fair, and assures that each is afforded the same potential opportunity in evaluation. It’s entirely up to you, just like with coffee or tea. However, you should remain consistent and always evaluate absinthes the same way. Perhaps trying a glass both ways will demonstrate interesting things about your personal preferences. Next: How to use the system to add your rating. Like a five-star restaurant, a five-point absinthe is going to be of uncommon quality: nearly flawless and a standard to which others should aspire. Unlike most restaurant ratings, where a one-star rated restaurant might be an interesting but very casual place to dine, a one-star absinthe is considered poor to the point of unacceptability. We tried to reserve a zero rating for this, but it turned out to be problematic in programming the rating component on our web site. A five-star rating on any particular criteria should be reserved for perfection or very near perfection, i.e., no improvement desired or necessary. Use the information below as your guide to score the criteria. Your score will be noted in your review and the average user score for that absinthe will be automatically updated. If you're doing a group tasting, a separate review and score must be entered for each person. You must be a registered user inthe discussion forums in order to leave reviews. Register using the link at the page. When you signify that you'd like to leave an absinthe review, an administrator will set up a review account for you. Anyone may download, print, and distribute the score sheet for use in personal or group tastings, commercial or private. • Navigate to the absinthe you wish to score and review and click on the text "Add new review" and the review pane will open. There will be a next to each criteria on the scoring form. Hovering over the icon will display the criteria tips as shown below. • Rate the absinthe or other product on a 1 to 5 scale, with 1 being very poor and 5 being perfect, consult the criteria tips if necessary. • Leave your comments. Your review comments are not required, but will be helpful to others looking for opinions on this absinthe, which is the whole point of the system. Use this section to explain your findings and give your overall opinion of this product. While we encourage strict honesty and frankness in review comments, all user-reviews are moderated and vulgarity and abusive language will be removed. A good review will be instructive not only to the consumer, but to the maker as well, as either praise for an excellent product or advice as to how a product might be improved. The distillers do pay attention! Next: How to add a new product to the guide. You can do it! • Click on the Submit New Item link in the Absinthe Reviews menu at the left or on the Add New Item Here link at the top of each category section. Authentic Absinthes are those, of whatever level of quality or type of manufacture, which meet the criteria of a traditional belle époque style absinthe, i.e. above 45% ABV (90 proof), a primary flavor of anise and a detectable flavor of wormwood. Absinthe Substitutes & Pastis are products which are sold as absinthe substitutes or are characteristic of the category to such an extent that they may be judged by absinthe criteria. The reason for their inclusion here is so that people who find absinthe unobtainable can make informed decisions on what to use as a substitute in cocktails or as a drink on its own. Faux Absinthes & Novelty products are those which are sold and labeled as authentic absinthe but which are clearly outside the category. Either they lack enough anise to be qualified as an anise spirit, they lack wormwood flavor and/or their overall character is substantially unlike a traditional belle époque absinthe. These often fall into the more appropriate designation "wormwood bitters" or "wormwood flavored vodka." Novelty products will also include such things as mandrake or cannabis "absinthes". They are presented here so that the curious consumer can see how they compare to authentic absinthe. • Fill in the Product Details. Wherever possible, this information should be identical to entries already in the system, to facilitate search results. Please check your spelling against other entries first. Name of Product: This should be exactly as spelled on the label or on maker's or vendor's web site. Style: Select either Verte, Blanche, Rouge or Other. Year of Make (if known): Leave blank if uncertain. Distiller/Manufacturer: This is the name of the actual distillery which produces the product. This is usually not the vendor. Web site: The official website of the maker. You may submit up to four images of the product, limited to 100 Kb. A thumbnail of the first image uploaded will appear with the item in the search result lists, the rest will apear on the review page for that item. • Click submit! The item will appear after it is approved by an editor. You may then post a review if you choose to. That's all there is to it. Have fun and please drink responsibly!